A Fourth of July tradition, the Nathan’s Famous Hot Dog Eating Contest is held every year at the original Nathan’s Famous Hot Dogs on Coney Island. It’s said the contest originated in 1916, when four immigrants arguing about who was more patriotic. To prove their patriotism, they challenged each other to a hot dog eating contest. Whether it’s true or not, Nathan’s has been officially organizing the event since 1972. Prepare to be amazed. Last year’s winner ate 70 hot dogs in one sitting. Getting there: Take the Q train (direction Coney Island) to the end of the line from 34th Street - Herald Square. A “less-traditional” NYC summer tradition is the Midsummer Night Swing at the Lincoln Center. For almost 30 years, the Lincoln Center has been throwing the best dance parties on the Upper West Side. And because this year Midsummer Night Swing falls on the holiday, this July 4th edition is especially American. Swing the night away to the tunes of Louis Armstrong, performed by NYC favorites David Ostwald’s Louis Armstrong Eternity Band. Dance lessons start at 6:30 and the music gets going at 7:30. Getting there: Take the 1 train from 34 St. - Penn Station (direction Van Cortlandt Park - 242 St.), to 66 St. - Lincoln Center. It’s not Fourth of July without fireworks. 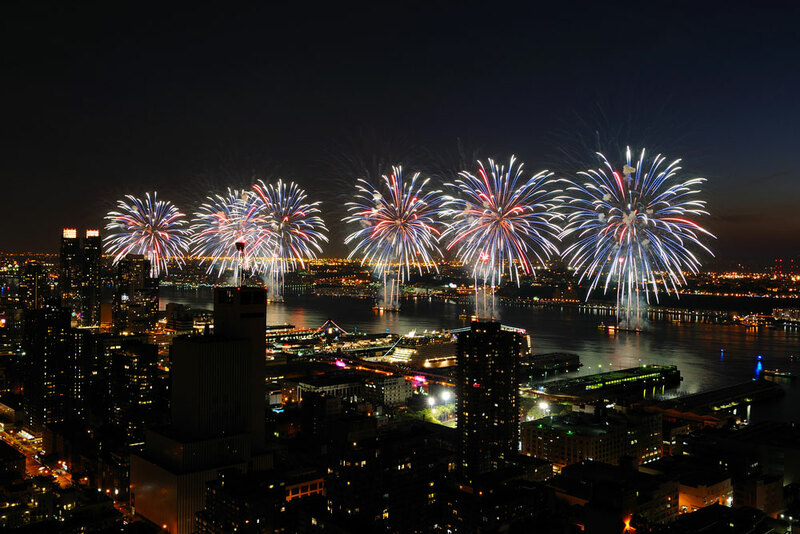 And when it comes to fireworks on Fourth of July, New York City does it best. That’s because Macy’s is behind the celebration. And it just so happens that The New Yorker has one of the best seats in town. Macy’s launches the fireworks from barges on the East River between 24th and 41st Streets, and The New Yorker is located on 34th Street - right in the middle. Now, if you’re looking to eat and drink while the fireworks are going on, check out our recent post on NYC rooftop bars. What’s more American than going to a baseball game on the 4th of July? Going to a Yankee game on the Fourth of July. Luckily, the Yankees are playing on home field this holiday against our northern neighbors, the Toronto Blue Jays. The game starts at 12 p.m. - To get to Yankee Stadium from The New Yorker, take the D train from at 34 St - Herald Square Station (direction Norwood - 205 St) to 161 St - Yankee Stadium Station). Planning a trip to the Big Apple? Check out our packages for special discounts and money-saving offers.